Vivian Vande Velde takes the tale of Little Red Riding Hood and twists it into eight totally original, hilarious, and new tales. With these eight new tales, she has created something unforgettable. The characters will stand out more than anything. She has characters ranging from talking dolls to vampires. Each tale was humorous and fun, but most of all, I enjoyed the one with the werewolf and the vampire- like Twilight and little Red twist. This does bring out a few questions. Like, what were the Grimm Brothers thinking? Poor Red was named after a piece of clothing- what is that? It makes me wonder what the real version was. How can this same tale be twisted so many ways and still sounds awesome. There's a basis for every Little Red story- a wolf, a red hood, and grandma- the rest is up to your imagination. "Once upon a time, after fashion was discovered but before people had makeovers on TV, there was a young girl named Meg." It's such a great book! 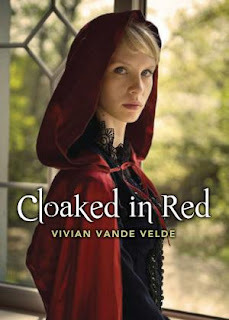 Vivian Vande Velde has been one of my favorite authors since I first started reading. She's amazing! Great review!